Chinatown Inn on Third Avenue has been open for over sixty-five years. With Macy’s Downtown Pittsburgh store closing this year I thought it might be a blue Christmas. After all, for many of us Pittsburgh kids, Kaufmann’s—Macy’s predecessor—was the place our parents would take us to see Santa Claus, scope out the latest toys, and revel in the holiday splendor of the decorated windows. Post-excursion we would sometimes stop in Kaufmann’s casual restaurant, The Tic Toc Shop, for a burger and shake. 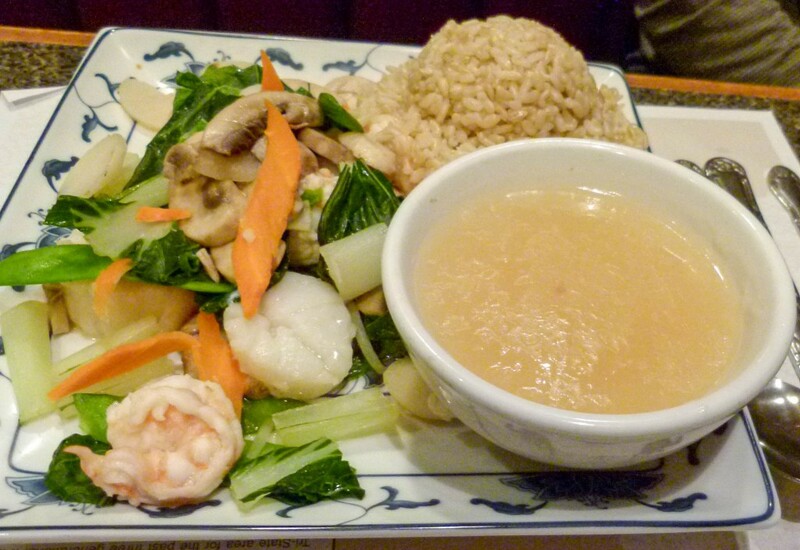 Other times we would venture to Chinatown Inn in Pittsburgh’s faded Chinatown neighborhood. My parents—Richard and Anne—along with my sister, three brothers and myself would go to Chinatown Inn on Light Up Night and other occasions. This was the first Chinese food I ever experienced. Yuen Yee (the manager) and Roy (a Chinese waiter) would always greet us warmly and make us feel welcome. Roy quickly brought us kids our requisite Shirley Temple and Roy Rogers fancy soda pop drinks, each with maraschino cherries on a plastic sword, drink umbrella, and straw. We then indulged ourselves on wonton soup, egg rolls, and chicken chow mein, followed of course by fortune cookies. Roy was very patient in showing us how to hold and use the chopsticks, which always enthralled us. We would try to use them for a while and then usually switched back to our forks for faster food consumption with our familiar cutlery. 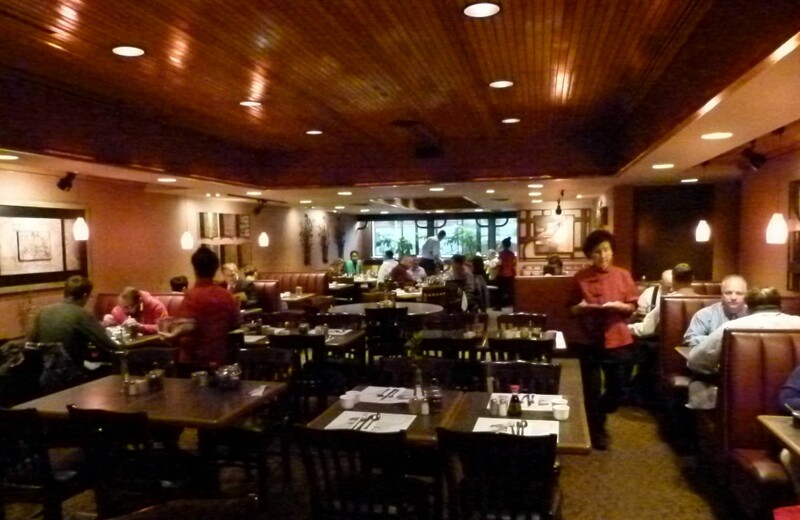 The restaurant is now run by third-generation owner Jonathan Yee. The comfortable interior of Chinatown Inn. In thinking about Macy’s Downtown closure and its bringing back wonderful family memories, I thought, I haven’t been to Chinatown Inn for ages. It was definitely time to head back there again. I called my friend J.B., who’s always up for a lunchtime outing, and picked a day to go. For my upcoming visit I decided to recreate my usual meal from years ago. I picked up J.B. and parked in the adjacent Boulos parking lot. We then entered the restaurant. Aah, I was now back in the friendly confines of Chinatown Inn. The restaurant seemed larger now; maybe it had expanded since I was last there eons ago, or I didn’t recall the space correctly. Either way it was a pretty room—its look somewhere between traditional and contemporary, with booths and tables. Our server quickly appeared table-side and had a pleasant manner. I told her of my desire to re-create a meal that I used to eat many years ago as a young child. She was gracious and accommodating, and our order was soon in. First came the Shirley Temple which was much bigger than the ones we had as kids. I must have been quite a lunchtime sight, an adult drinking an over-sized Shirley Temple with all its decorative elements! I didn’t care; I was having fun reliving a memory. Crab rangoon with dipping sauce. In addition to the menu items I enjoyed back in the day, I ordered crab rangoon and J.B. ordered steamed vegetable dumplings. Both were tasty standard appetizers. 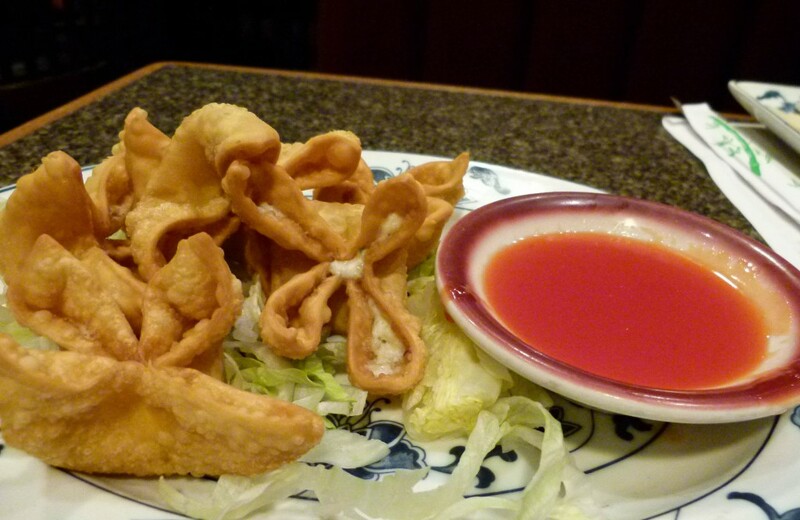 The crab rangoon were crisply fried flower-shaped pieces of dough with a cream cheese, semi-sweet white center containing a slight hint of crab flavor and other subtle seasonings. The vegetable dumplings had a properly cooked noodle casing with chopped vegetables and spices inside. Both were good items to segue into the rest of our dishes. The wonton soup had a savory chicken broth that was not overly salty, with tasty wontons consisting of an egg noodle with seasoned pork filling, and chopped pieces of green onion and thin strips of pork giving texture to the broth. The shrimp egg roll was perfectly crisp and delicious, consisting of an assortment of Chinese vegetables and several shrimp. I spooned out some fruity/tangy duck sauce and a few dabs of spicy mustard onto my egg roll just as I had first started doing years ago. I also learned back then that too much spicy mustard will make your nose burn and your eyes tear up. An important lesson. 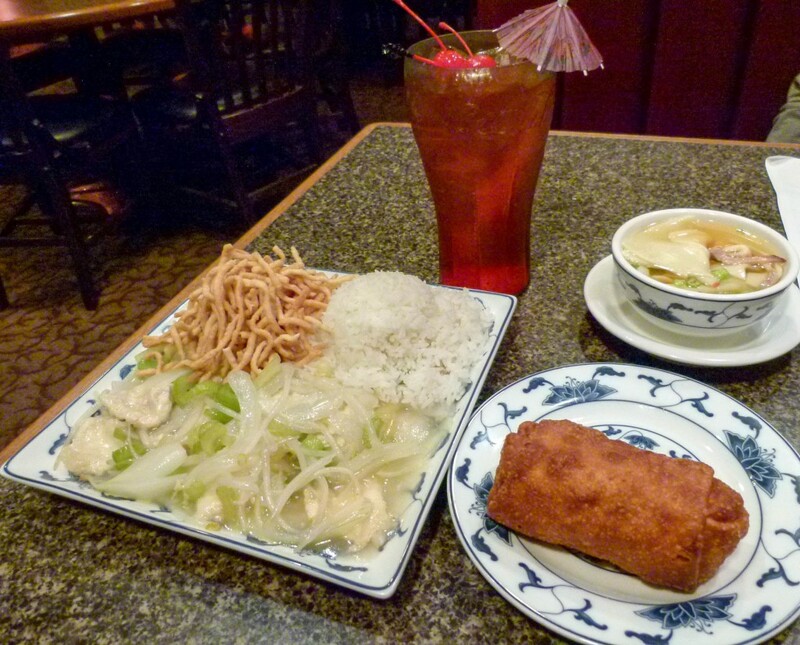 This meal is a re-creation of what I used to order as a young child with my family at Chinatown Inn. Next up on my meal re-creation was chicken chow mein. The chicken was the tender flat filets you find in most Chinese restaurant chicken dishes. It was served in a tasty, lightly seasoned white sauce, mixed together with a good selection of Chinese vegetables and served with white rice and crispy chow mein noodles. J.B’s shrimp and steamed brown rice with the sauce on the side. J.B. enjoyed his shrimp and brown rice with the brown sauce on the side. He said it was very good, as was mine. The meal re-creation was a fun and scrumptious success! After cracking our fortune cookies open and reading our fortunes out loud to one another, we left with me reliving past memories and J.B. creating a nice new one. While it’s natural to be saddened by Macy’s departure, there is definitely cause for joy in the fact that Chinatown Inn is still in operation and going strong. I won’t wait so long to get back there again. 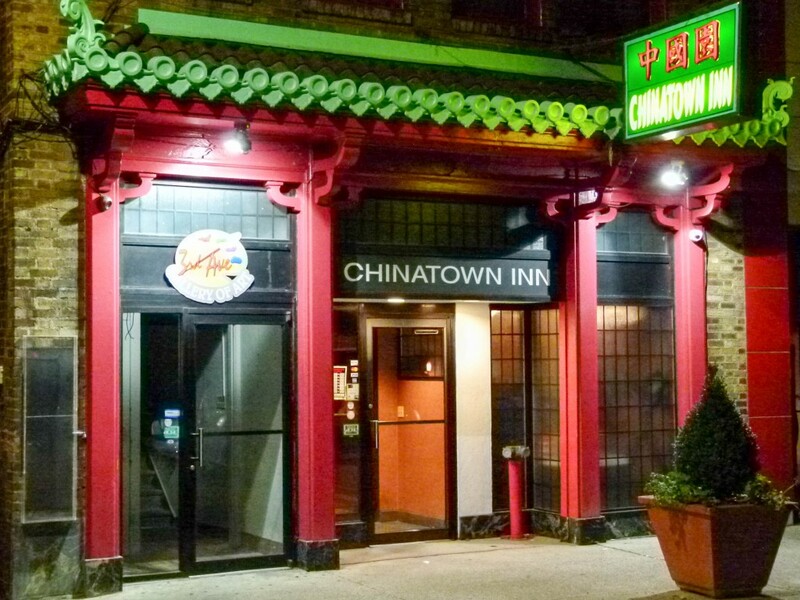 Monday – Thursday, 11 a.m. – 9:30 p.m.
Friday, 11 a.m. – 11 p.m.
Saturday, noon – 11 p.m.
Sunday, 2 – 9:30 p.m.
Chinatown Inn has a full bar and accepts all major credit cards. Rick Handler is the executive producer of Entertainment Central Pittsburgh and loves fun dining experiences.